The eastern Free State is God’s own country. Wide open plains as far as the eye can see occassionally punctuated by rock outcrops & rolling grasslands flanked by magnificent mountains which form part of the western foothills of the Maluti mountains. This time of the year the landscape is lush & green, seasonal pink & white Cosmos flowers adding splashes of colour to an otherwise drab roadside. It is a landscape that is good for the soul which instantly liberates you from the confines of city life. This is big sky country inhabited by big hearted people. People still in touch with their humanity, still in touch with the old-fashioned, farming virtues of kindness, hospitality, generosity, courtesy & civility. The area has a rich local history of story-telling, legends & African Basotho folklore.This story is about Valerie Wilcocks & Johan Bestendig De la Harpe, a young couple in love. Only a year separated them. Valerie was a beautiful young woman, spirited & independent minded & her boyfriend Johan, a handsome & adventurous young man in his prime. It was the summer of 1932. Clarens was only twenty years old, a tiny village established in 1912 with dirt roads & sandstone cottages built by Cornish stonemasons. Named after the eponymous Swiss village where President Paul Kruger spent his last years in exile. The young lovers would mount their horses & ride out from the farms of their respective families to meet at a rendezvous in the mountains near Clarens so that they could spend time precious together. They met in secret against the express wishes of their parents because of a long simmering feud between the Wilcocks & the De la Harpe families. Through the ages the sandstone caves in the area served as dwellings for San hunter-gatherers, provided shelter for Basotho worshippers & refuge for Boer families fleeing farms torched by British troops during the Anglo Boer War. We can only speculate but perhaps the young lovers met in one of these caves. One day while riding near Mont-Aux- Sources, cruel fate unleashed a double tragedy upon their families. The young lovers were struck & killed by lightning. Their grieving families set aside their differences & buried the young lovers next to each other. Valerie was twenty two years old & Johan was twenty one. They died on 18 December 1932, one day after Johan’s twenty second birthday. 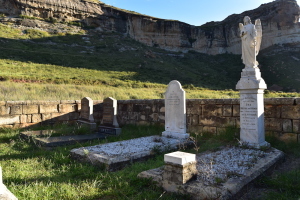 When you travel on the road from the picture perfect Free State village of Clarens towards the Golden Gate Highlands National Park, after 17 kilometres or so you will drive through the check point & after a few kilometres you will see a small cemetery on the left hand side in a grass clearing. Turn off the road & stop next to the Van Reenen family cemetery. The dozen or so graves are enclosed by a low sandstone wall. Above the cemetery on the right, the Rooiberge of the eastern Free State with their eroded cliffs & exposed, horizontal sandstone strata in golden hues of ochre, red & orange, stand as silent sentinels watching over the graves. Behind the cemetery, on the banks of a river which meanders through lush grassland & reeds, a solitary Weeping Willow tree, its long, thin branches whipped by the wind. This is a well chosen & peaceful, final resting place for loved ones. In this tiny cemetery on the side of the road you will find the graves of Valerie & Johan lying beside each other. 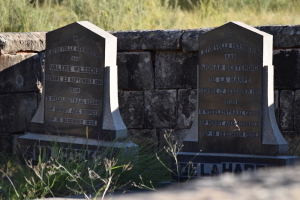 In the same cemetery you will find the grave of a brave young hero called Nathan van Reenen lying just below below the tombstone of his brother Laurens. Nathan was slain by an unknown assailant on 7 December 2013 in Durban whilst coming to the assistance of a victim of crime. He was sixteen years old. The local Sotho people living in the area say that when dark storm clouds gather, you will see Valerie & Johan riding off into the distance. Ride on & forever to a better day.